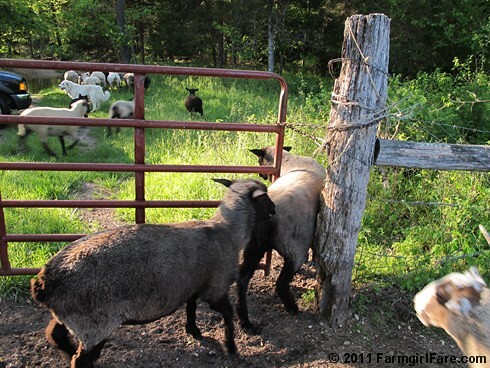 Farmgirl Fare: Monday Dose of Cute: Off To Greener Pastures! © FarmgirlFare.com, where a silly old donkey gate will never stop a bunch of starving sheep—or even a bunch of sheep with full bellies on their way back to The Shack for the night. (Well, not to The Shack, as in curled up on the sofa watching Babe, but near The Shack.) These woolies go where they want. when people tell us "I'd like to have goats" we like to explain about fencing and gates - if water can get through it - so can a determined goat!